The severe weather described in my last has somewhat mitigated, and although the thermometer in the shade only ranges from 10 deg. to 15 deg. Centigrade, the sun is warm, and shines brightly every day. The great topic of interest now is the arrival of Buffalo Bill and his "Wild West," which is announced for Tuesday, the 11th inst. The accounts from Rome, that have appeared in our local journals, have advertised the performance better than miles of posters, and the loquacious Florentines are already as familiar with his name as with that of Michael Angelo. The grounds engaged for the show are situated at the end of the Lung' Arno della Zecchia Vecchia, near the Arno and Viale, where the tramways pass at the upper end of the town. 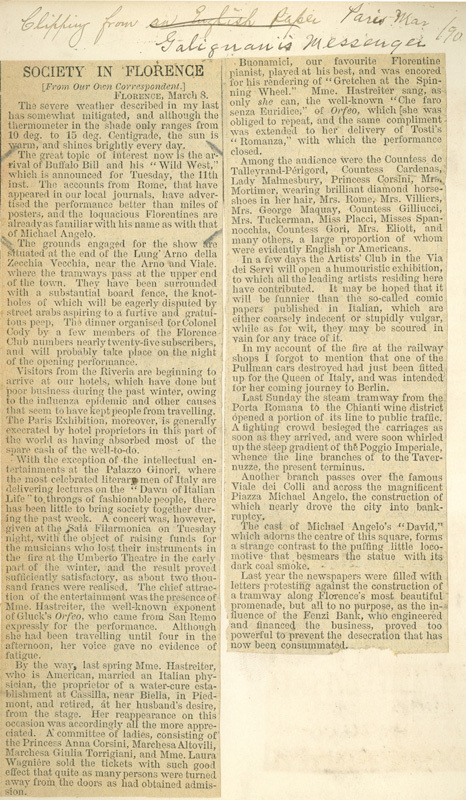 They have been surrounded with a substantial board fence, the knotholes of which will be eagerly disputed by street arabs aspiring to a furtive and gratuitous peep, The dinner organised for Colonel Cody by a few members of the Florence Club numbers nearly twenty-five subscribers, and will probably take place on the night of the opening performance. Visitors from the Rivieria are beginning to arrive at our hotels, which have done but poor business during the past winter, owing to the influenza epidemic and other causes that seem to have kept people from travelling. The Paris Exhibition, moreover, is generally execrated by hotel proprietors in this part of the world as having absorbed most of the spare cash of the well-to-do. Note: EXCERPT ONLY... first four paragraphs of article; remainder of article omitted.